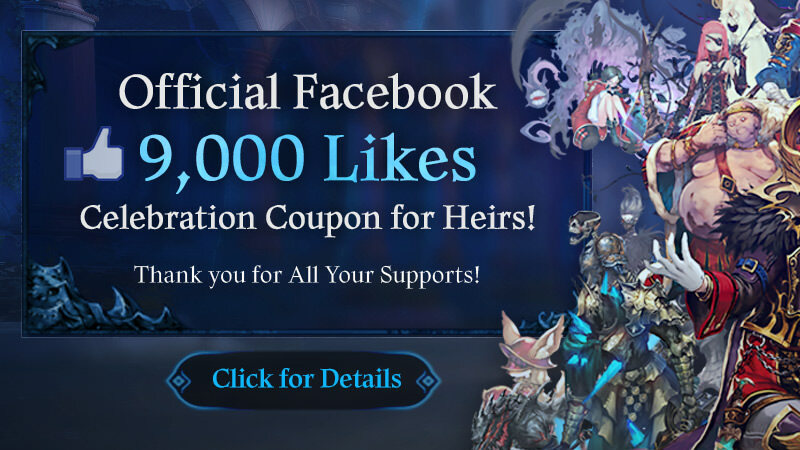 The Official Heir of Light Facebook has reached 9,000 Likes! I, Heylel, would like to gift in-game Coupons to all Heirs as a token of appreciation. Thank you for all your support and continue to support the Church of the Morning Star! > Claim 9,000 Likes Celebration Coupon! > Make sure to log into the account you wish to claim rewards on first, then completely turn off the app and click the provided link below! 9,000 Likes Celebration Reward: 10 x Epic Summon Stone. 1. Click on the Coupon. 2. Open Heir of Light. 3. The reward will be in your Mailbox. ** Pop up stating that the game must be installed will show. Click "Install", it will automatically run Heir of Light. - All users must click on the link in order to claim the rewards from the coupon. - We cannot issue new rewards If the coupon is claimed on any other account than the one you wish to claim on. Last edited by CM_Heylel; 09-14-2018 at 10:25 AM. Please follow the steps to claim coupons. 1. Completely exit the app. 2. Access the Forum post from an internet browser / Facebook Post from Facebook App. 3. Click on the Coupon. 4. Open Heir of Light. 5. The reward will be in your Mailbox. After following the steps, you will still receive the pop up stating that the game must be installed. But if you click "Install", it will automatically run Heir of Light. Once you log in, the reward will be in your mailbox.